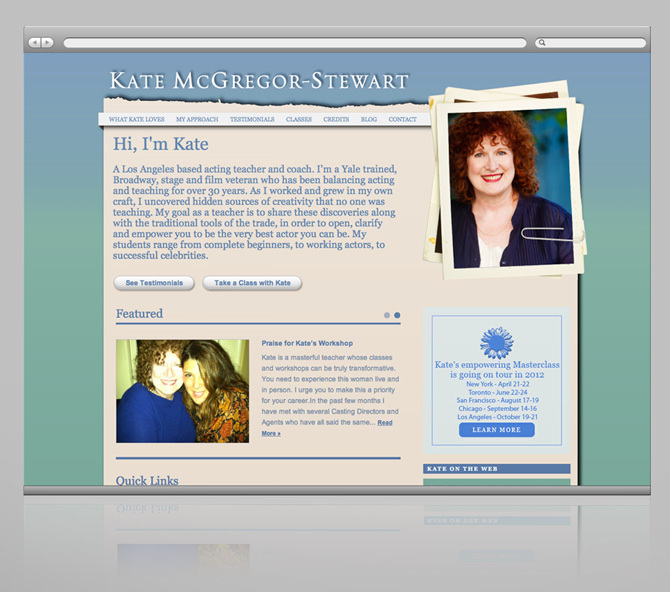 Website for acting coach Kate McGregor Stewart. A veteran of Broadway, tv, and film, Kate teaches a variety of workshops and classes around the country and coaches everyone from beginners to celebrities like Nicole Kidman, Woody Harrelson, James Gandolfini and Heather Graham. Under her coaching, Marisa Tomei won an Oscar for her work in My Cousin Vinny. Site uses a custom WordPress content management system, as well as integration with Twitter, YouTube, and Facebook. A training series was also included so Kate could update her website easily on her own.